Gettin' Sauced 2012 Bottled Contest Winners! 143 sauces competed in this year's Gettin' Sauced! Bottled Contest. Below are the winners of each of the 7 categories. After the category winners were selected, a new group of judges tasted & scored all 7 category winners. The result was the overall winner, which is also listed below. Congrats to all of the winners! Saturday was the launch of All-Star Sauces, a mail-order club for award-/contest-winning BBQ sauces. Man Up Texas BBQ, LLC, is half of the joint venture behind the program, which is comprised of 6 vendors per year (For 2013, each vendor is from a different state!). Each vendor has at least 1 BBQ sauce that has taken first place in an official contest or that has won a national award. Take a look at the vendors for 2013, our inaugural year. The program is simple: 2 sauces are shipped to your door every other month (At least 1 of these sauces is a contest/award winner.). That's 6 shipments per year (12 bottles total). We offer 3 subscription plans (each of which includes shipping & handling): Customers can purchase 1 shipment (2 bottles), 3 shipments (6 bottles), or all 6 shipments (12 bottles). Shipments go out in early Jan, Mar, May, Jul, Sept, & Nov. If you wish to receive the next shipment, order by 5 PM Central on the 15th day of the month before each shipment month. So, if you want to receive the January shipment, order by 5 PM Central on December 15. Wanna know more? See the program's Terms & Conditions. An All-Star Sauces subscription is a great purchase for yourself, your family, and/or your friends! In addition to being a 1-stop shop for multiple award-winning sauces, the program will provide customers with special offers unavailable to the general public. Stay tuned for such deals/discounts. In the meantime, check out our website, peruse the FAQ page, and contact us if you have any additional questions or are interested in being an All-Star Sauces vendor. Gettin' Sauced! is in the books! I'll post pics, videos, & contest results a bit later, but today, a word of thanks to everyone who was part of yesterday's 3rd Annual Gettin' Sauced! contest/festival. To our sponsors: Thank you. To all of our BBQ and non-BBQ booths: Thank you. To our venue, Hops & Grain: Thank you. To our live-music acts: Thank you. To our contestants: Thank you. To our contest judges: Thank you. To all of our volunteers: Thank you. And to everyone who came out and enjoyed the BBQ, sauce, drinks, vendors, & live music: Thank you. We truly appreciate all of you and thank you for spending your Saturday with us. Cheers to all of you. It's Saturday. It's not blazing hot. There's no home football game. It's Austin. It's BBQ. It's craft beer. Just do it! 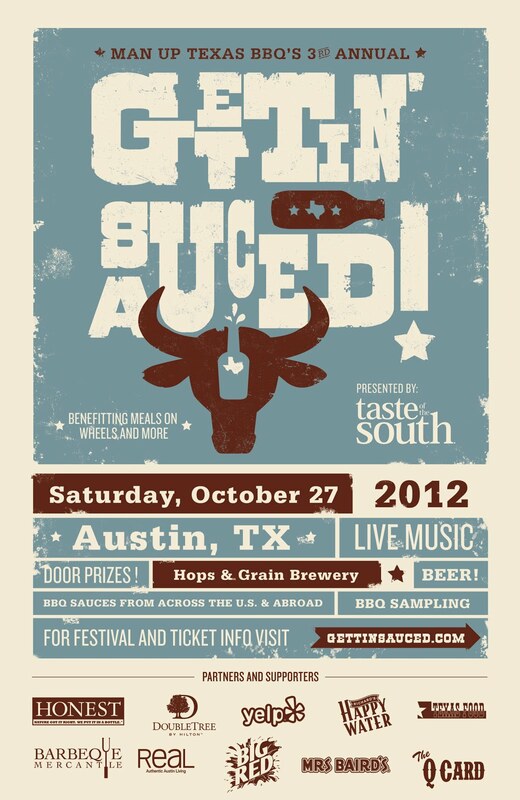 Tomorrow is our 3rd Annual Gettin' Sauced! BBQ-sauce contest & festival. If you don't want to taste the BBQ & BBQ sauce, then the event is free. Just stop by and enjoy the booths, live music, and cold refreshments from Hops & Grain. However, if you want to try the BBQ and/or sauce from our 15 food/sauce booths, you have to have a BBQ-sampling wristband. At the entry gate & at the entry to the BBQ corridor (where the booths are lined up), you can pay $10 cash for a wristband. So, if you don't want to wait at the entry, just come on in and head to the back of the festival, where the BBQ corridor is located. You can purchase a wristband there. You must present a valid wristband to enter the corridor. UNTIL NOON TOMORROW, you can purchase a wristband for $8 via Eventbrite (Same goes for our $25 VIP pass). If you do so, your name will be on our will-call list at the entry gate. There will be a will-call table. Just walk up, present a valid photo ID or your Eventbrite confirmation, and we'll slap a wristband on you. Hope to see you tomorrow. Keep your fingers crossed that the weather will cooperate. Pardon the wrinkles. They came like that. Like our pint glasses and koozies, you can purchase this year's official Gettin' Sauced! t-shirt at the event on Saturday. After the event, we will sell them via GettinSauced.com. I'm excited to announce the live-music lineup for this Saturday's 3rd Annual Gettin' Sauced! Two acts. Both Texan. 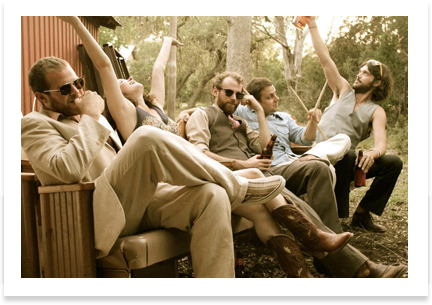 Kicking things off will be Austin's very own Sour Bridges, which played at last year's event, followed by the Anson Carter Band. Look them up on their websites, Facebook, MySpace, & YouTube, & be sure to snag some of their merchandise at the event! Picked up the trophies for this Saturday's Gettin' Sauced! BBQ-sauce contest: 1 for the overall winner of the Bottled Contest & 1 for the winner of the People's Choice Contest. These winners, along with the Bottled Contest's category winners will get a writeup in next year's BBQ issue of Taste of the South magazine. In addition, all winners are eligible for All-Star Sauces, the mail-order club for award-winning BBQ sauces that we are launching later this week!!! 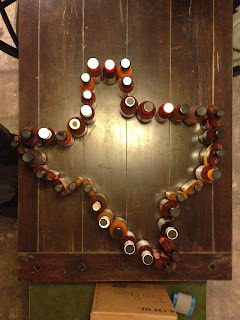 In a few days, we will announce the launch of All-Star Sauces, a mail-order program for award-winning BBQ sauces. The official launch of the program will be one week today at our Gettin' Sauced! festival. At the event, you will be able to place an order. Everyone who signs up for the program will take home one of those oh-so-nice All-Star Sauces trucker hats! Our Gettin' Sauced! pint glasses have arrived! We'll have them for sale at the festival next Saturday. They are also included in our VIP package. Gearin' up for Gettin' Sauced! On October 27, barbecue enthusiasts of all ages are invited to get their fix of barbecue sauce, local craft beer and live music at Man Up Texas BBQ’s 3rd Annual Gettin' Sauced! festival, presented by Taste of the South magazine and hosted by Hops & Grain Brewing. The event will feature a contest of 150 sauces from the U.S., Canada, and Australia, samples of barbecue and barbecue sauce from more than a dozen vendors, local craft beer from Hops & Grain Brewing, live music by Anson Carter and Austin-based Sour Bridges, door prizes and more. Event entry is free, though sampling the barbecue and barbecue sauce will require a barbecue wristband, with both general admission tickets ($8 online and $10 at the gate) and VIP packages ($25 online and at the gate) available. A portion of all proceeds will be donated to Meals on Wheels and More. 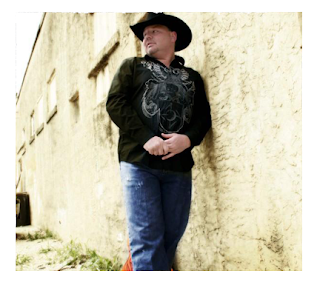 VIP packages include entry to the event 30 minutes before general admission, a Gettin’ Sauced! pint glass, a Gettin’ Sauced! koozie, The Q Card, a one-year subscription to Taste of the South magazine, a Taste of the South koozie, & more. Visit the Gettin' Sauced! website for complete details.